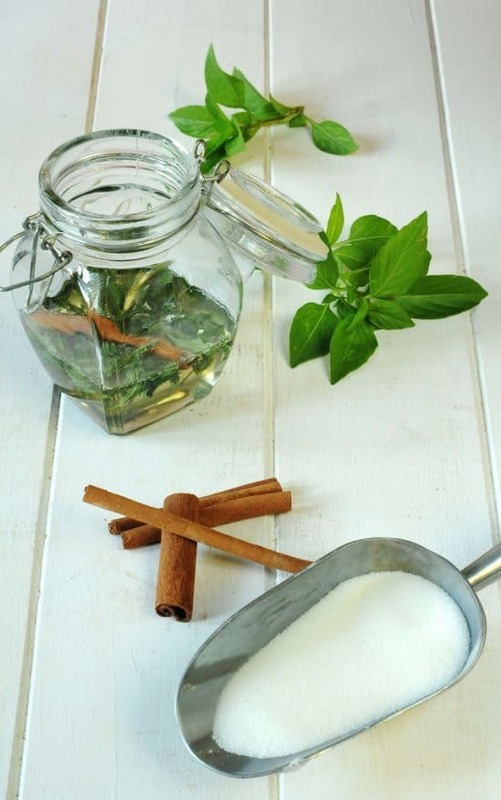 Cinnamon Basil Syrup is a simple sugar syrup flavored with cinnamon basil leaves. Listen closely and you might hear the cinnamon basil growing in my garden–it’s growing so fast. Up to now, its purpose for existing was undiscovered. But I think I may have found it. This weekend I made shortcakes as part of my baking with the Tuesdays with Dorie group. 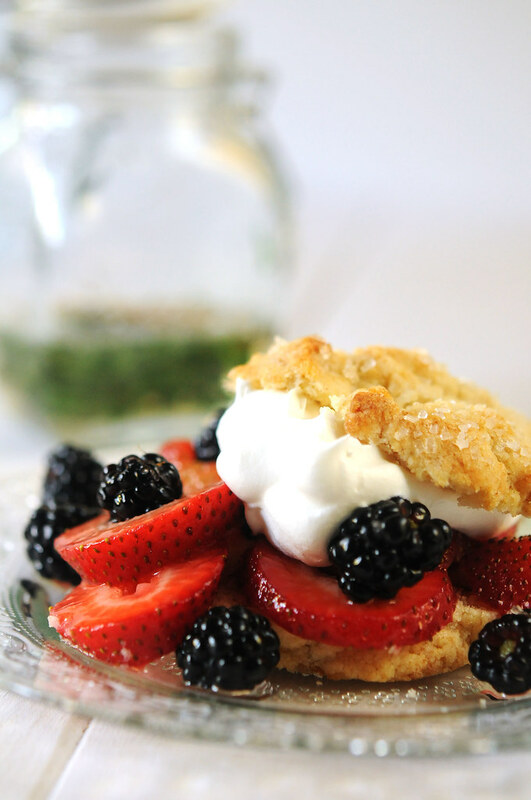 Her Tender Shortbread recipe called for plain, granulated white sugar to sweeten the berries. I got the idea to make a sugar syrup and steep some of the cinnamon basil in it as it cooled. Although it’s simple, it adds a subtle but interesting flavor note to the berries that highlights the ginger and cinnamon spiced shortcakes. If you don’t have cinnamon basil, you could use fresh sweet basil instead although I would use only a half cup of leaves. A simple sugar syrup with cinnamon basil leaves steeped in it. Heat sugar and water in 2 cup or larger Pyrex bowl in microwave to boiling. Stop and stir until sugar has dissolved. Add leaves and cinnamon stick, pushing under the surface of the syrup to steep. After 30 minutes, remove leaves. Pour cooled syrup over fruit. So I made this last year and it was fabulous!!! =) I just made my first batch of the year while eating a pear. I drizzled a few drops of the simple syrup on my pear and and it was over the top. Now, I am inspired to use this recipe for a pear sorbet or poached pears. =) By the way, this recipe is one of my (home) bar favorites. 1 part vodka, 1 part apple juice, 1 part cranberry juice and a good splash of this simple syrup shaken and served in a martini glass. Oh my!!! When pear season coming on, I can’t wait to try this. Awesome recipe. I am pulling out my cinnamon basil plant tomorrow. I am definitely going to try your recipe. Just curious, do you know the shelf life of this type of simple syrup? That sounds delicious and the photo of the shortcakes with those berries looks wonderful. I am going to have to get some berries from the local berry farm. I’ve never heard of cinnamon basil, what a great combo. Gorgeous, yummy looking shortcake! Nice combination….I have never heard of cinnamon basil. What is the more dominant flavor? IS it hot/spicy? I would love to try this brushed on a cake ..thanks for the tips! It is part of the basil/mint family but not as strong as sweet basil. And of course, it has a cinnamon smell/flavor although not terribly intense. Cinnamon basil syrup sounds so interesting, and I’m sure it tastes great with your shortcakes! That looks great, lovely photos too. Another idea I have done with herbs is to infuse them into the jelly I make, same idea as above. It really gives a depth of flavor that is delicious. That sounds so good. May be an excuse to make some jelly or jam. Cinnamon basil… I grew that one year, but just have sweet (regular, boring) basil this year. Still… I have numerous cinnamon sticks – so I should be set! What a great recipe for summer! Wow, really great flavor ideas! You are so clever with the syrup. I would love to try using this. Basil is more versaitile than I gave it credit for and I have some growing a few feet away. Beautiful shortcakes. Wow your cakes look so good. The yummy cinnamon basil syrup really gives the fruit some sparkle!